The Supro Westwood was built in the mid to late 1950’s as a full bodied, single pickup, single cutaway carved spruce top archtop guitar. The sides and back are maple, the neck likely poplar with rosewood for the fingerboard and bridge. The top, back and F-holes are bound. This very nice guitar is in original condition and it’s fairly recently had a refret with modern wire so it plays very well. The nitrocellulose lacquer finish shows expected wear for a 62 year old, with some finish checking and a few finish chips that don’t penetrate the wood. On the top, there are some pick marks from enthusiastic strumming. 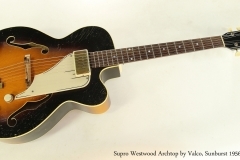 The Supro Westwood pickup looks like a humbucker, but it’s really a single coil in a large case. The tuners are original single line Kluson models with creme plastic tulip buttons. 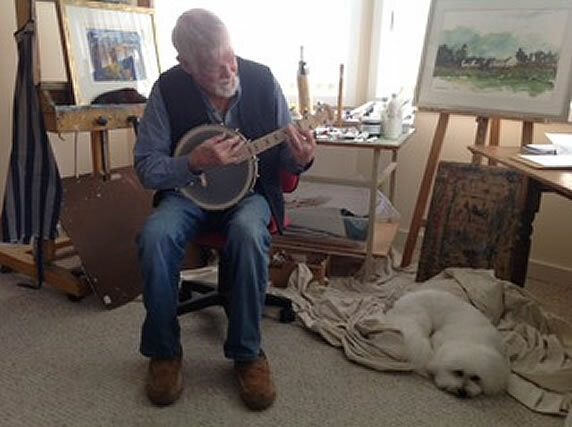 The nut, tailpiece and bridge are original. The creme plastic pickguard is intact with some of the painted-on striping worn, but is not cracked. The pickup surround has small cracks above the adjustment screw, but is otherwise intact. The original cases for these instruments was fibre (cardboard) with a light, brown cloth lining. That type of case does not usually age well and often disappears with time. A non-original hard shell case is included. 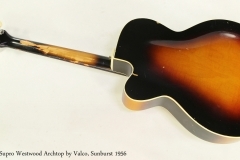 Supro instruments were one of the brands made by Valco, which was a successor to both National and Dobro. National itself became one of Valco’s brands; the company name was based on the first letters of the three owner’s names – Victor Smith, Al Frost, and Louis Dopyera – plus ‘co’ for ‘company’. Originally based in Los Angeles, Valco moved operations to Chicago in the 1940’s because that city was the hub for many large retailers including Sears, Roebuck. Valco produced guitars under a number of its own brand names, and amplifiers for many outside companies including Gretsch, Kay and Harmony. The company merged with Kay in 1967, but went bankrupt in 1968.